45 percent of normal adults snore every now and then and you may be one of them. Snoring can be amusing as it is treated as a joke in gatherings, but it can also be annoying to those people who are bothered by the sound of it while they’re trying to get some sleep. Either way, you’re pretty sure you’ll be just fine without it. In fact, it’ll be awesome to let others sleep in peace. Moreover, snoring can also lead to medical problems. 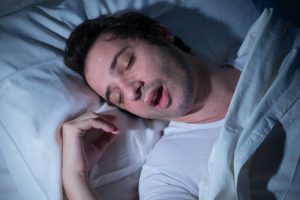 In a study, it was found that 75 percent of people who snore have obstructive sleep apnea, which is characterized by breathing disruptions for brief durations. This condition has also been found to heighten the risk of developing heart disease. You may think it is just the way it is and there’s nothing to be done about it. Wrong – there are actually remedies you can do, or maybe even not do, in order to get rid of your snoring once and for all. Sleeping on your side can help since lying on your back results to the base of your tongue and soft palate falling down to the back wall of your throat. Use a full-length body pillow in order to help you maintain sleeping on your side. This really makes a notable difference. If this doesn’t work, you can attach something round to the back of your pajamas to prevent you from lying on your back. In the case that it also doesn’t work, you might be looking at obstructive sleep apnea as the culprit. You need to consult with your doctor to be sure. Losing weight can help some, though it does not apply to all since even slim people snore. However, in the instance that you gained weight and snoring began after that when you didn’t before – only indicates that weight gain played a vital role in the matter. In this case, weight loss is the apparent solution. Furthermore, if you put on weight around your neck, it results to the constriction of the internal diameter of the throat. A collapse can happen as a consequence, which leads to snoring. Alcohol and other sedatives lessen the resting tone of the muscles in the back of the throat. When this happens, there’s snoring as a result. When you drink alcohol 4-5 hours before getting shut-eye, your snoring will even get worse. In fact, experts say that those who don’t normally snore will do once they begin drinking. This explains why drunkards have the worst snores of all. If you’re always tired and sleep deprived, it makes you super exhausted when you finally go to bed that you fall into a deep and hard slumber. This makes your muscles limper, causing you to snore. This explains why people who are fatigued snore when they sleep. If you change your poor sleeping habits to normal, you won’t be as exhausted as before and your muscles will remain firm, thus, no snoring. This is helpful if the snoring begins in your nose because it enables air to move through more gently and unhurriedly. If there’s obstruction in your nose due to cold or other reasons, the air that moves through it quickly can possibly generate snoring. Try hot shower before hitting the sack as it’s known to open nasal pathways. A bottle of saltwater rinse can also help. You can use it for your nose while showering to widen pathways. You should know that there’s a buildup of dust mites in the pillow. These can cause allergic reasons, which leads to snoring. If you let your pets sleep in the bed with you, you’re also inhaling animal dander, which usually causes irritation. To avoid dust mites, place your pillows in the air fluff cycle once in every few weeks, as well as change them every six months. This way, dust mites and other allergens are minimized. Also, if you’re a full-pledged snorer, you might want to keep your pets out of your bedroom. It is essential that you drink lots of fluids. When you’re dehydrated because you’re not a fan of gulping healthy liquids, the secretions in your nose and soft palate become more sticky. The result is snoring. Healthy women should consume about 11 cups of water from all drinks and food each day, while men need to consume 16 cups.